As many expected, Conservative "star candidate" Julian Fantino has won the seat of Vaughan, held by Liberals for 22 years. He defeated Liberal Tony Genco by 997 votes, or just 2.5%. Some in the media have been speculating that if the Liberals lose Vaughan, they would refrain from defeating the Tories and provoking an election this coming Spring, or even through 2011. However, the situation is murkier due to the unexpected Liberal win in Winnipeg North, where Kevin Lamoureux beat Kevin Chief, who was trying to hold the seat for the NDP, by 795 votes, or 5.1%. This win will prevent Liberal morale from sagging due to the loss in Vaughan, but the worry remains that the Conservatives have made significant inroads in the inner portions of the 905. 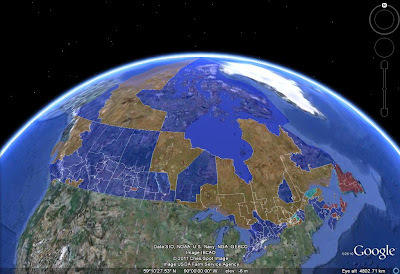 Finally, as expected, the Tories carried Dauphin--Swan River--Marquette in Manitoba by over 30%. Turnout was 32.4% in Vaughan, 30.8% in Winnipeg North, and 26.9% in Dauphin-blah-blah. Low, but not disastrously so. I would refrain from reading too much into these results. Certainly, this was a good night for the Conservatives, and a bad one for the NDP. However, the electors that voted today will only form about half of the electorate for the next general election. Because of the close margins in Vaughan and Winnipeg North, it is difficult to tell who would would have carried those ridings had the general election voters turned out. - In 416-adjacent seats, Tories can win by a small margin with a star candidate. But this means that such seats would probably remain Liberal in a neutral match-up. - There has been no great change in the 905 political landscape since 2008. Of course, this is unsurprising, since recent Ontario poll numbers are very similar to the 2008 election results. Finally, an interesting fact: due to Vaughan's fast growth and Manitoba's over-representation in the House, there are more registered electors in Vaughan (120,864) than in Winnipeg North and in Dauphin-etc. combined (104,747). In fact, there were more votes cast for Tony Genco (18,263), the losing candidate in Vaughan, than for all candidates combined in Winnipeg North (15,780) or Dauphin-SW-M (14,411). After two weeks of no new national poll, the regular one from EKOS is out. The past two weeks of EKOS polling suggest that the Tories now lead in Atlantic Canada. 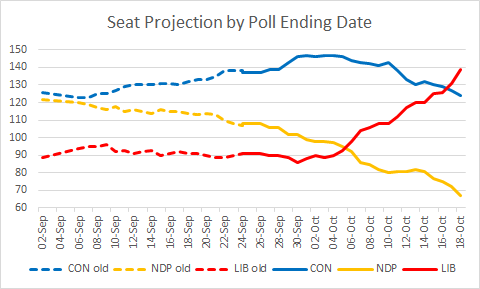 In Québec, there has been no real movement, though the NDP posted stronger numbers than in past EKOS polls, and are now close to a second seat in my projection (though that's actually mainly due to the Léger poll described below). Ontario is still a Liberal-Conservative tie. The most noteworthy numbers of this poll are in BC, where after a few good polls, the Liberals are back to third place status. The Liberals were hurt by the EKOS numbers in Atlantic Canada and BC. In terms of the popular vote, the Tory lead is now pegged at 6.3%. The increase is mostly due to the reduced weight put on the previous EKOS poll, which was a bit of an outlier in showing an almost tied race. Sorry for the lack of posts these past few days: work got a little crazy. Since the last update on the Canadian scene, four polls have been released: Abacus, Ipsos, Nanos and EKOS. 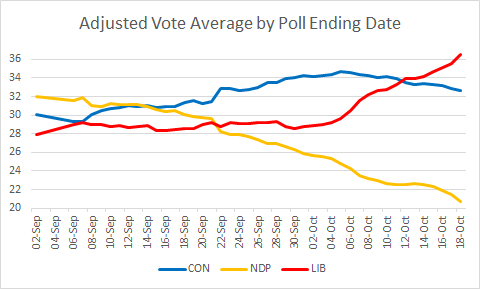 These polls have tended to be good for the NDP: it averaged around 18%, and has regained the ground lost in the early fall. The Liberals also got good numbers in BC, polling above 30% in both the Nanos and the EKOS surveys. Did Gordon Campbell resigning help Ignatieff? Three of the four polls had the Tories ahead by around 5% in Ontario, but the largest and most recent one, EKOS, has the Liberals on top by 2% there. The average Conservative national lead has not changed much, and sits at 5.8%. Here are a summary of results and updates to this post as final numbers trickle in. - CO has gone for the Democrats. With what appears to be all regular ballots counted, the Democratic candidate has increased his lead to about 15,500 votes, or 0.9%. [11/4] The gap is now about 15,650 votes. - [11/4] WA shows a lead of 3% for the Democratic incumbent, with 75% of the count completed. This is looking very good for the Dems. [11/4] This race has now also been called for the Dems. - VA-11: All votes are now in, and the Democrat has increased his margin to 920 votes, with about 390 provisional ballots left. Tentative Democratic hold, though the GOP is entitled to a recount. I will move this back to the too-close-to-call category if a recount is requested. [11/5] The final margin is 968. [11/9] This race has been called by the AP. - KY-6: It turns out that the 600-vote margin mentioned in the previous post was based on all (as opposed on almost all) precincts. Also a tentative Democratic hold, with possible recount. [11/5] The final margin is 649. A re-canvass (which is not a recount) will be conducted on 11/12. [11/12] The re-canvass has confirmed the result, and the Republican conceded. - IL-8: The Democratic incumbent has cut her deficit to 553 votes. All regular ballots have been accounted for, but there are possibly several thousand provisional and absentee ballots left. [11/5] The gap is now 350 votes, and counting will continue until 11/16. [11/17] The Republican held on to win by 291 votes. - CA-11: The last batch of regular votes has put the Democratic incumbent ahead by 121 votes, with many absentee ballots still to be counted. [11/4] The gap is now 134 votes. [11/5] The Democrat's lead is now 548 votes, and counting continues. [11/9] The margin has increased again, to 632 votes. [11/12] The gap is now 1,690 votes. Looking good for the Democrat. [11/17] The margin has grown slightly to 1,757 votes. [11/19] The gap is now 1,783. [11/22] The margin is 1,788, and looks unlikely to change much. Democratic hold, although the AP has yet to call the race. [11/24] The AP has now called the race. - [11/4] WA-2: The Democrat is now leading by 648 votes, with 73% of the count completed. [11/5] The Democrat's lead is now 3,872 votes, with 90% of the votes counted. This is starting to look like a Democratic hold. [11/9] A Democratic hold indeed: with 98% of the votes counted, the incumbent leads by almost 2%. - [11/4] NY-25: This one is back in the too-close-to-call column: the last batch of votes was strongly Republican, putting the GOP ahead by 659 votes. Around 10,000 absentee ballots remain to be counted. [11/5] The GOP's lead has slightly increased to 684. The number of absentee ballots is around 7,000, and those will only be counted starting 11/15. [11/19] The Democrat now trails by only about 300, but is unlikely to make up more ground. [11/21] The count is almost complete, and the Republican leads by 567. It's time to declare this a Republican win, even though there has not yet been a concession, and the AP hasn't yet called the race. [11/23] The Democratic candidate has conceded. - [11/6] NY-1: An error has been discovered in the tally. Instead of the Democrat winning by about 3,500 votes, the Republican is now ahead by about 400, with around 9,000 absentee ballots to be counted. [11/19] The Democratic incumbent has pulled ahead by 15 votes. This one is going down to the wire. [11/23] The Democratic lead is now about 200. [12/8] Democratic hold. - [11/9] CA-20: This one is back in the too-close-to-call column, as the Democrat's performance in absentee ballots allowed him to close the gap from about 3% to just 27 votes. [11/12] The Democrat now leads by 1,107, and will probably win in the end. [11/17] The gap has again expanded, to 1,428 votes. [11/19] The Democrat's lead is now 2,742. The AP has not called the race, but I'll go ahead and designate this a Democratic hold. [11/23] The Republican has conceded. - There are 6 other uncalled races that I've included in the tally of the leading party. Of these, two apparently have especially many uncounted absentee ballots: CA-20 (R lead) and NY-25 (D lead), where the gap is provisionally 1.6%. These could go back into the too-close-to-call column, but for now the gap in each is over 1%. The other uncalled race is TX-25, where the Democrat, losing by about 0.8%, has requested a recount. I'm not yet putting this one back in the too-close-to-call column since the gap exceeds 0.5%. [11/23] After the recount produced little change in the vote totals, the Democrat has conceded. - Of the 7 uncalled races as of the last post, the 3 where I identified a tilt have been decided. As expected, the GOP picks up ME, regains FL (the sitting governor was elected as a Republican, but is now an Independent), and the Dems pick up VT.
- CT: The AP still has the Republican up by 0.7%, but the Democratic Secretary of State has said that when all votes are counted, the Democrat would likely win by about 3,000 votes, or just under 0.3%. [11/4] The AP now has the Democrat up by 0.5%, with a few precincts still to go. [11/5] The AP calls the race for the Democrat, but the Republican has not conceded due to irregularities. - MN: All votes are in, and the Democrat's 0.5% lead is confirmed. Crucially, it's just under 0.5%, so unless canvassing produces a change, there will be an automatic recount. [12/8] Democratic pickup: the Republican has conceded after the part of the recount process. - OR: Like in CT, the GOP lead has been cut to 0.7%. 4% of the precincts have yet to report, almost all in Multnomah county (central Portland), where the Democrat has carried 70% of the counted vote. [11/4] The Democrat has won the race: as expected, he vaulted ahead when Multnomah came in, and now leads by 1%. - [11/4] IL: The Democrat has increased his lead to 0.5%, or about 19,400 votes, with all regular ballots counted. However, there are probably more than 100,000 absentee ballots left. [11/5] The Republican has conceded this race. Relative to expectations, the midterm elections in the US were a mixed bag for both parties. Here is a tentative summary of what happened in Senate, House and Governor races. - Harry Reid's relatively easy win in NV proved all pollsters in the last 3 weeks of the campaign wrong. It's not a big surprise since everyone knew it was going to be close, and President Obama significantly outperformed polls in NV in 2008. Still, the margin of victory (5%) is higher than what most would have predicted. - CO and WA are also likely to remain Democratic, in which case the Dems would have 53 seats, making their majority defection-proof. The gap in the vote count is about 7,500 votes in CO and 14,000 votes in WA. CO looks to be the safer of the two: most votes have been counted, and almost all of the outstanding ones are in Democratic counties. Again, pollsters have been proven wrong here: no one gave the Democrat a lead in the last month of the campaign. There is a lot of counting left in WA, but King county, which includes Seattle, is a bit behind the rest of the state, which is a good sign for the Democrat. - PA flipped to the Republicans, as expected. However, the margin there was only 2%, much less than the poll consensus. The margin in WI, which the GOP also took over as predicted, is also a bit lower than expected. - Meanwhile, WV easily remained Democratic by 10%, a much larger difference than polls suggested. - Overall, pollsters overestimated Republican support in almost all close Senate races, though NV was the only state where they were far off. This pales in comparison to their performance in 2006, when the consensus polling average was essentially on the dot in every close state. 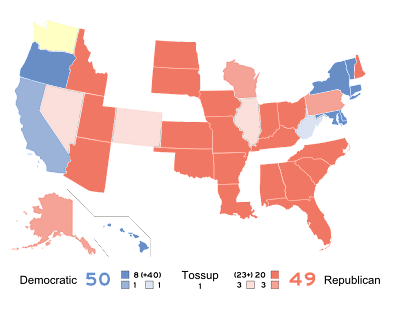 - In 2012, 23 Democrats and 10 Republicans are scheduled to face an election. Even in a neutral environment, Democratic losses would be expected. The unresolved races in CO and WA are crucial: with 53 seats, the Dems have a fighting chance of maintaining their majority beyond 2012, but with just 51, that would be hard to do. - In the House, 11 races remain uncalled, though only 5 are genuinely unsettled: VA-11 (Dems lead by 500 votes), KY-6 (D +600), IL-8 (R +800), WA-2 (R +1400), CA-11 (R +23). In each of these districts, only a few precincts are missing, except in WA-2, where due to postal voting, about 36% of the vote may be outstanding. CA-11 is almost certainly headed for a recount. - Splitting the above 5 races evenly gives the GOP 243-244 seats, a gain of 65-66 relative to the 2008 election. This is the highest Republican total since the 1946 election, the biggest Republican seat increase since 1938, and the biggest Republican seat increase constituting a takeover since 1894! However, the last two Democratic Presidents facing a GOP takeover of a comparable magnitude, Truman and Clinton, were both comfortably reelected two years later. - The Republican wave, while huge, was also not much bigger than expected: only 10 or so more seats than what most pundits called for. According to Nate Silver of FiveThirtyEight, the national popular vote was fairly well estimated by pollsters; the GOP swing was just a bit more efficient than expected. - Relative to the 2008 election, the Democrats lost seats in 34 33 of the 46 states where they had at least one. The wave hit everywhere, but less hard in New England (where NH was the only state out of 6 to elect Republican representatives) and on the West Coast (where the Democrats lost only 2-4 1 districts). Outside the Northeast and the West Coast, the Democrats won 136 seats out of 274 in 2008, or about 50%. This time, they're down to about 86, or about 31%. - CT: the GOP has a healthy 1% lead, but 10% of the vote, reportedly mostly from Democratic strongholds, remain outstanding. This race turned against the Democrat in the last 10 days, which polls did pick up. - IL: the Democrat has a 0.3% lead, with a few precincts left. This is a surprise, as the GOP candidate was favored. - MN: the Democrat has a 0.5% lead, with a few precincts left. This is closer than expected, though the Democrat may well hold on. - OR: similar to CT: the GOP has a 1.1% lead, but 11% of the vote, mostly from around Portland, have not yet been counted. This one was a tossup. 1. Senate races are more prominent. If you're a young or unenthusiastic voter filtered out by pollsters' likely voter screens, you're more likely to defy expectations and actually vote in a close Senate race than if the most important close race where you live is for the House. 2. It just so happens that the close Senate races were in states where pollsters had a GOP bias. Maybe the same pollsters would overestimate Democratic vote if the close races were elsewhere. 3. Pollsters are different for the House and the Senate, and it just so happens that Senate polling firms made errors in the same direction. 4. Undecided voters broke for the Democrats only in Senate races. Perhaps these voters really want to send a message to the Dems, but have no confidence in the GOP. After agonizing for a long time, they decide to split their ticket: send a message with their House vote, which they can change in 2 years, but not taking a risk with a somewhat unknown GOP Senate challenger, whom they can only throw out in 6 years. I will post an update when most of the remaining races are resolved. The latest Harris-Decima poll confirms that the Tories have opened up a lead in late October. The big difference from the EKOS and Angus Reid polls from the same period, however, is that no such lead has appeared in Ontario: indeed, Harris-Decima has the Liberals ahead by 1% there. Rather, this poll has the Tories leading by 14% in Atlantic Canada; given that no poll has had the Tories up by more than 5% there (and that many have shown a large Liberal lead), this is probably just due to the small sample issue. The other interesting thing is that this is the 5th consecutive poll showing the Tories at 33% or less in BC, and the NDP at 26% or more there. Gains in BC could well offset expected losses in Ontario for the NDP if this trend continues. The average Tory national lead is at 6.1%. While the Canadian federal political scene has been, all things considered, fairly calm these past few weeks, things have been heating up for the midterm elections here in the United States. Most prognosticators, of which Nate Silver at FiveThirtyEight is probably the most sophisticated statistically, are predicting about a 15-seat majority for the Republicans in the House (equivalently, roughly a 30-seat gap between the GOP and the Dems) and the Democrats barely holding onto the Senate. The picture below shows my own Senate ratings. All in all, there are 48 seats virtually assured for Democrats or senators caucusing with the Democrats (40 not up for election, 8 safe seats), and 43 seats virtually assured for Republicans (23 not up, 20 safe) - these are expected to be carried by double digits or high single digits. Of these, ND, IN and AR are pickups for the GOP. Then, there are 4 seats where the outcome seems fairly certain (normally, these should be carried by mid to high single digits), but a perfect storm could create an upset. CA should remain Democratic, while AK should be carried by either the Republican candidate, or the Republican incumbent running as a write-in independent (but who will stay in the GOP caucus is re-elected). Meanwhile, PA and WI are likely pickups for the GOP. With these seats, the count is 49 Democrats and 46 Republicans. Finally, there are 5 seats, all currently held by Democrats, where the outcome is very much in doubt. Unless they can win CA or poach one of the existing Democratic caucus members (like Joe Lieberman or Ben Nelson), the Republicans need a clean sweep of these states to take control. The GOP currently holds an edge in IL, NV and CO. Nevada is of particular interest, since Senate Majority Leader Harry Reid could lose his seat. Also, WA, where the Democratic incumbent has been favored throughout the race, has recently become a pure tossup. On the other hand, the popular Democratic candidate and current governor is now ahead in WV, despite the overwhelming unpopularity of President Obama in his state. My best guess for the result in the Senate is 51 Democrats and 49 Republicans. Basically, I get 50.5-49.5 by splitting the pure tossup of Washington state, and round up for the Democrats as they have fewer questionable seats than the GOP in that count. If WV and CA stay Democratic, then barring some defection, the Senate will remain Democratic as Vice President Joe Biden casts the tie-breaking votes. But if one of those two states flips, WA becomes determinant. That would potentially make for a long period of uncertainty: the vote there is likely to be extremely close, and the state, which votes almost entirely by mail, only requires that ballots be postmarked by Election Day.